Wholesale hand towels white 15x25-100% cotton Premium quality for use in Salons, Gyms, Spas, Hotels, schools, medical offices etc. If you are looking for a medium size hand towel this will be the product to go with, extra soft and bright white. There’s nothing quite like a fresh and clean premium hand towel made from supple cotton. Everyone loves the versatility of white towels. Whether you’re a business owner or a homeowner, elegant white towels make a great addition to your washroom, commercial facility, salon, spa and more. 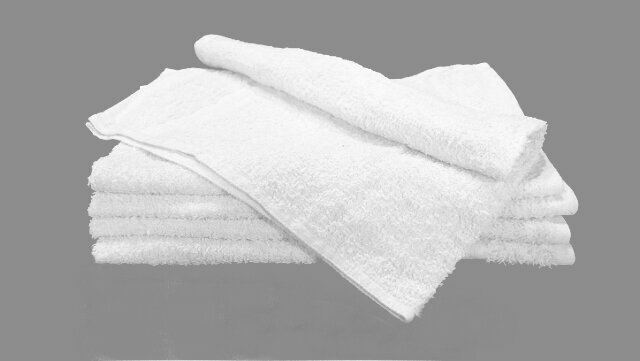 These quality towels are 15” by 25” and work for any job big or small. The material is absorbent enough to soak up moisture and luxurious enough to leave hands feeling soft and refreshed. Cotton hand towels are hardy and can tackle even the messiest spills. However, because it’s not constructed using manmade fabrics, those with sensitive skin will find it the perfect towel to keep on hand. We’re well known for our wholesale discounts. Our site is simple to use, and you can order anytime night or day. Get the premium hand towels you need today. After use, wash your premium hand towels as soon as possible. This lessens the likelihood of unpleasant odors, stains or discoloration. Rinse your towels immediately if they’ve been exposed to harsh chemicals, as those could cause them to lose strength and durability. Although you can use bleach, limit this. Bleach can be harsh on cotton fabrics, weakening their bonds. Use only enough as you need it. Consider using a high-quality bleach alternative, which provides the crisp, clean look without the bleach. Reconsider the use of fabric softeners as these can leave a slight residue which creates a moisture barrier. Instead of fabric softeners, use a fragrant dryer sheet to keep towels smelling fresh and feeling cuddly. Adding your logo to our premium white hand towels is the perfect way to get your brand out there in a unique way. Patrons visiting your business will appreciate this finer detail which sets you apart from your competitors. If you would like to have a logo, motto or monogram on your towels, we can ship your order to a local embroiderer, saving you time and energy. Wholesale is ideal for commercial businesses like gyms, spas and salons that need a ready supply of towels handy at all times. However, if you’ve got a big family, you may want to consider buying your towels in bulk. You can stock your linen closet and save money by ordering more units. So, whether you’re in the market for fresh towels for your home or business, Towel Super Center can help. We provide our premium hand towels at prices far below retail, whether you’re buying a dozen towels or ten dozen. Contact us today for all your towel needs..